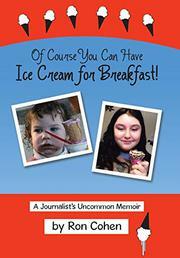 OF COURSE YOU CAN HAVE ICE CREAM FOR BREAKFAST! In this debut memoir, a journalist retraces his steps in the hope that his beloved grandchildren will understand the forces that shaped him. With palpable fondness, Cohen addresses the story of his colorful life directly to his grandchildren, several of whom live too far away for regular contact. In seeking to make his experiences real for them, he offers all of his readers a vivid portrait of a particular segment of 20th-century life. Beginning with his childhood in New Jersey as the son of an Italian mother and a Jewish father, Cohen captures the contradictions of American multiculturalism in his descriptions of his warm, rowdy Italian relatives (complete with a recipe for spaghetti and meatballs) and Jewish grandfather, whose cold silence masks the pain of the Russian pogroms and the loss of his wife to influenza. Ancestors, family members, and neighborhood characters come alive in Cohen’s lively episodic prose, as in one scene where a local gangster responds to his “trick or treat” with a box of 48 Hershey bars (“plain, no almonds”). Through it all, Cohen is appealingly self-deprecating as he owns up to his mistakes, including his first job as a Good Humor man, when he cannot resist giving away ice cream to “curly-haired little girls”; a college alcohol binge that results in the death of a friend; and his tendency to nearly get fired on the first day of each of his journalism jobs. Some of Cohen’s most intriguing passages describe his career working for newspapers in Illinois and Connecticut and his years at the news service United Press International, where he had an up-close view of pivotal historical and political events while seeking the ever elusive Pulitzer Prize. The book is long and episodic (Cohen suggests early on that audiences may wish to “color outside the lines and select chapters randomly”), and some readers may find his presentation choppy. But the narrative is so warm and exuberant that few should be able to resist it. An affectionate and compelling account of the life of a reporter that is deeply personal and irreverently comic.